Thank you, Bob, for the kind introduction. Good afternoon and welcome everyone. I want to thank all of you for coming today. We especially want to welcome Patrick Delatour, Minister of Tourism, who is charged with heading up Haiti’s reconstruction and development efforts, and our other Haitian guests. I also want to thank our panelists for their participation. Mr. Minister, let me begin by expressing our deep condolences to the people of Haiti for the devastating loss of life and property suffered during the January earthquake. Please know that the Obama administration and the Department of Commerce are committed to assisting the Haitian people with their reconstruction and recovery needs. This business dialogue is the first of several events the Commerce Department is planning with the private sector to explore rebuilding needs and opportunities in Haiti. And I’m glad to see such strong interest, not only from the U.S. business community, but the Haitian private sector as well. Haiti has tremendous economic potential. Tragically, when the disaster struck, Haiti’s economic future was brighter than it had been in five years, and it was beginning to attract new business. GDP had grown four percent in 2009. But today, lives have been shattered, and entire parts of Port-au-Prince and the country are in ruins. Private sector participation is crucial to Haiti’s long-term economic growth and stability. And that’s a key element of the “Action Plan for National Recovery and Development of Haiti,” which was presented by the Haitian government to the international community on March 31 at the U.N.
To support Haiti’s recovery efforts, the Commerce Department is planning additional business outreach events in New York on May 10; in Miami on May 25; and Philadelphia on June 7. Our National Institute of Standards and Technology is working with private-sector partners on the development and use of building standards that can make structures in Haiti more resilient to future earthquakes and hurricanes. And Our National Oceanic and Atmospheric Administration just participated in high-level discussions with the U.S. Department of Agriculture and Haitian government counterparts to discuss rural economic growth, the development of fisheries and aquaculture and the promotion of watershed management structures. Finally, as we move toward a medium- and long-term focus, the Commerce Department can build on its established programs in good governance and corporate social responsibility to help Haiti institute development programs that improve its economic environment from the ground up. 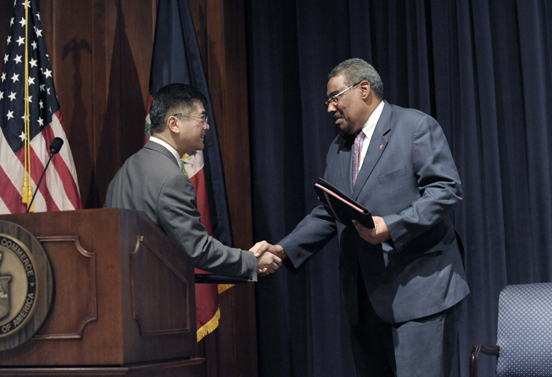 Such programs can help Haiti create a strong and sustainable investment climate and economy. As with any recovery, Haiti’s efforts will focus in large measure on the creation of jobs and opportunities for its people. You—the private sector—will play a critical role in providing these opportunities through the trade and investment that will benefit people in both Haiti and the United States. With such opportunities, Haiti can gain greater economic independence, and the Haitian people can contribute meaningfully to the progress of their nation. The U.S. government is here to be a partner in that effort. I have invited some of my colleagues from other U.S. government agencies and international lending institutions to discuss ways to help Haitians develop an environment that supports investment and Haiti’s long-term growth and sustainability. We look for our conversations today to mark the beginning of fruitful partnerships where the U.S. business community plays a key role in Haiti’s reconstruction and recovery. And now please welcome Minister Delatour. I want to thank this distinguished panel of executives for being here with us today. Our panelists represent a range of industry sectors, and each has extensive experience doing business in Haiti. There’s clearly a great deal of interest in business opportunities associated with Haiti’s reconstruction. I would like to open the discussion by asking our panelists to give those in the audience a sense of the challenges your companies encountered doing business in Haiti as well as any insights you can share as to how they were overcome. I would like to first ask Scott Morris, senior vice president and general counsel at Trilogy International Partners, to make his presentation. Thank you, Scott. Telecommunications will undoubtedly be a crucial piece of Haiti’s infrastructure as it rebuilds. Our next panelist is Jay Brickman, Vice President of Government Services at Crowley Maritime. Thank you, Jay. Shipping and port infrastructure are clearly also fundamental to the infrastructure of this island nation. I would like to next ask Jerry Cook who is Senior Vice President of Government and Trade for HanesBrands to share with us his company’s experiences operating in Haiti. Thanks, Jerry for those insights on the apparel sector. And last, but not least, I would like to now ask Bruno Ramos of BEA Architects to make his presentation. Thank you, Bruno, and my thanks to all of you again for taking the time to share your experiences with us and all of you for being with us today. Unfortunately, I have to leave, but I will turn the floor over to our Master of Ceremonies, Senior Commercial Officer for the Caribbean Region Robert Jones to continue with the question and answer period for the panelists.